Ridleyandra morganii is one of the rare gesneriads having pinnately lobed leaves. Leaf form. The leaves are estipulate, that is without “stipules” (lateral appendages at the base of the leaf that usually develop precociously). However, in species of Rhytidophyllum stipule-like “auricles” are formed at the petiole base, differing from true stipules by the late development. A petiole is usually present. The lamina is usually simple, the form ranging from linear through lanceolate, elliptic, ovate, and cordate to almost orbicular. The margin can be entire, crenate, dentate, or serrate. Sinuate, shallowly or deeply pinnately lobed leaves are rare. Examples are Ridleyandra morganii, Codonoboea pectinata (formerly in Henckelia and Didymocarpus), Henckelia pinnata and H. pinnatifida (formerly in Chirita). Opposite leaf arrangement. The opposite (decussate) leaf arrangement prevails and is the primary condition in the family. Whorls of three (“ternate leaves”) sometimes occur as an abnormal condition or can be a consistent character (e.g. Didissandra ternata, Gasteranthus ternatus). Whorls of four or more leaves are rare. 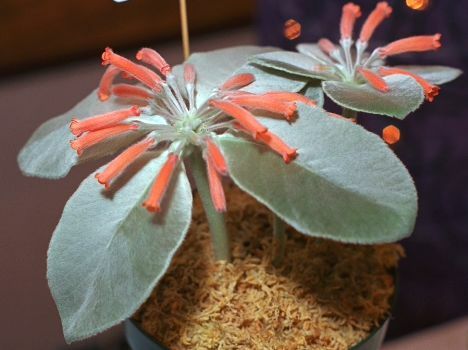 A good example of a four-whorled leaf arrangement is Sinningia leucotricha. Sinningia leucotricha is a rarity, a Gesneriad with a single whorl of four leaves. Anisophylly. Unequal size of the two leaves of a leaf pair (anisophylly) is frequent. Pronounced anisophylly is essentially combined with leaf asymmetry and changes in the divergence angles. In strongly anisophyllous plants the smaller leaves are often reduced to small, stipule-like appendages placed in two adjacent ranks on one side of the shoot axis, while the larger and strongly asymmetrical leaves are arranged in two nearly opposite ranks on the other side. These leaves turn their laminas into a single plane so that the whole shoot – usually held in a ± horizontal position – looks like a pinnate leaf with large and alternately arranged leaflets. Strongly anisophyllous taxa are found in all major groups of Gesneriaceae. 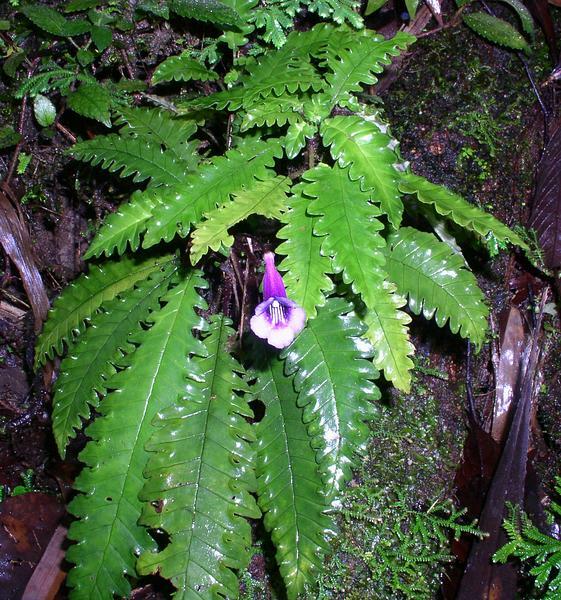 Striking examples include Columnea, Monopyle, Whytockia, Loxonia and Stauranthera. In Rhynchoglossum the smaller leaves are usually completely aborted, and the remaining, strongly asymmetric larger leaves approach a distichous arrangement (“alterniphylly”). 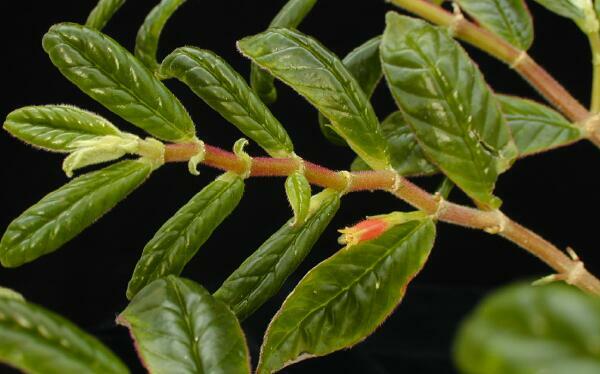 Columnea byrsina has opposite leaves, but one member of each pair is much reduced and eventually disappears. The result is an alternate-leaved appearance. Spiral leaf arrangement. This kind of leaf arrangement is less common in Gesneriaceae. In the New World Gesneriaceae this pattern is found in Gesneria, Rhytidophyllum, and a few others. A spiral phyllotaxis is often found in rosette plants, e.g. in Saintpaulia (now included in Streptocarpus, Nishii et al. 2015), in the European genera Ramonda, Haberlea, Jancaea, and numerous Chinese-Himalayan genera. Petrocosmea rosettifolia has a conspicuously dense and flat rosette similar to the “Dinner plate” (Aeonium tabuliforme, Crassulaceae). 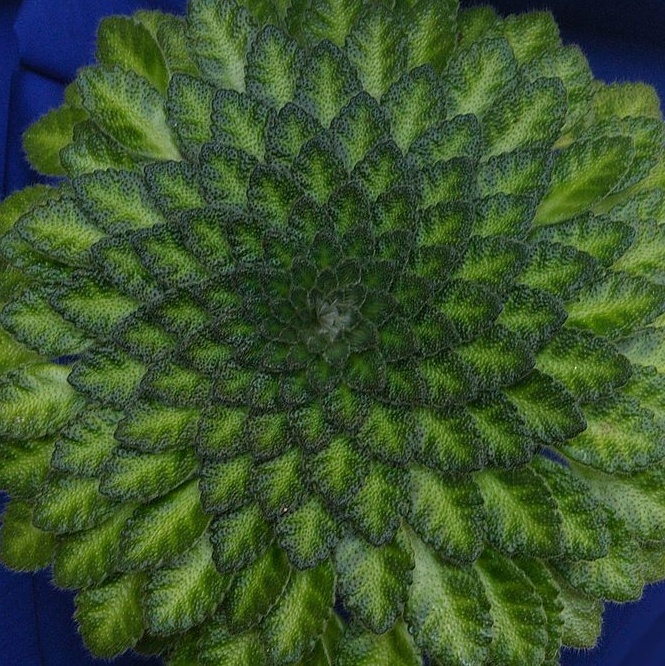 The dense and perfectly spiral arrangement of the leaves of Petrocosmea rosettifolia results in a kind of “Dinner plate”.